[Gallery] Dove Cameron at the 42nd Annual Gracie Awards. Dove Cameron, Events • By Mylene • Comments Off on [Gallery] Dove Cameron at the 42nd Annual Gracie Awards. Dove Cameron’s interview for DisneyNerds.com. Dove Cameron • By Mylene • Comments Off on Dove Cameron’s interview for DisneyNerds.com. There’s a part of me that struggles with the fact that the villain kids are still on the Isle of the Lost. Why do you think it took Ben to initiate bringing them over? Melissa: Probably because his parents didn’t want it at all. They didn’t even think about it until he thought of it. They were thinking of the villains as these horrible monsters and creatures and he was thinking of the children and how innocent they were. I don’t think it occurred to anybody until Ben came of age and could make proclamations to do anything about the kids on the Isle of the Lost. Dove: Came of age at the ripe age of 16! Time to run a kingdom son! How has your writing been influenced by the new live action film coming in July? Melissa: It’s always influenced by it! I get to visit the set, see the characters in costume, I go through the production stuff because we definitely want the books to translate that world into words. And it’s a prequel so you get to enter into that world through the books first. We find out that Agrabah and China are literally right next to each other. Melissa: I didn’t make the map! Is there actually a map of Auradon? Will we see a lot of other places coming up in the movie? Dove: I don’t know if we GO to the lands. You see a lot of the Isle and you also see little bits, fun things for the people who are paying attention. [Videos] Dove Cameron & Melissa de la Cruz Interviews. Dove Cameron, Events, Videos • By Mylene • Comments Off on [Videos] Dove Cameron & Melissa de la Cruz Interviews. 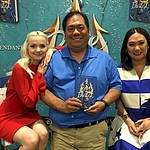 During the event of the release of the ‘Rise of the Isle of the Lost’ Dove Cameron and author Melissa de la Cruz gave some interviews talking about the book and Descendants 2. Dove Cameron’s interview for LaughingPlace.com. Dove Cameron • By Mylene • Comments Off on Dove Cameron’s interview for LaughingPlace.com. Marshal Knight: So, this is the third book in the series, Rise of the Isle of the Lost, and this will be the second movie in July. I was curious to know that we’ve had some time with the movie franchise and the book series if you guys have taken stuff from each other’s work. Like, if you’ve seen the movies and saw something that [Dove] added to Mal that was like, “Ooo, I can add that to the book,” and vice versa. Dove Cameron: And you wrote the books after we were all cast, right? MDLC: It was a project that everyone was part of, so it wasn’t like I was over here writing and they were over there. We would communicate and I would see all the drafts of the script and then they would show me the production things, so we really wanted to tie it in together. DC: I think it’s a weird misconception that the movies are based on the books or the books are based on the movies, actually neither is based on the other. MDLC: Yeah, they’re all combined. It’s interesting because it’s multi-platform. They always wanted it multi-platform. There are always a bunch of creators. MK: That’s awesome. So when [Dove] got the realization that you would be playing Maleficent’s daughter and [Melissa] would be writing these, how nervous were you to stray from what we know from the classics? Did you feel like there was a worry “I’m not going to be enough like Maleficent”? And even though it’s Maleficent’s daughter, did you [Dove] feel like you needed to pull from the Angelina Jolie movie more than the original or anything like that? And since you [Melissa] had all the characters to deal with? MDLC: My concern was really to tie-in to the original movies. I wanted it to make sense, you know? And then I watched all the original movies and all the villains died! So I was like, “Why are they on this island then? !” So, I really needed to figure out what’s worse than death…the Isle of the Lost. MK: It hasn’t been canon or anything. MDLC: Right, whereas we’re canon. MK & MDLC: Oh, absolutely. DC: Because Disney Channel is it’s own thing, it’s own beast, so to be told you’re involved in the classics is like, there’s nothing more delicious than that. I think that’s why we’re all so invested in the series and the franchise itself because it’s the first time! It’s the deepest honor, so for me, it was less nerve-wracking and the most delicious opportunity and I actually avoided seeing the Angelina Jolie film. MK: That’s good, ’cause it makes you feel obligated to go that route since it’s so recent. DC: Yeah, and it came out while we were shooting the first one, so Kristin and I were like “Promise, we’re not gonna do it,” ya know? DC: *laughs* Yeah, sorry Angie, you’ll have to wait. 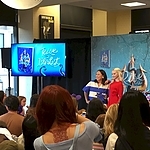 [Gallery] Dove Cameron at the ‘Rise of the Isle of the Lost’ Book Launch. 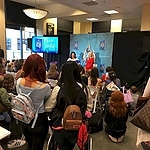 Dove Cameron, Events, Gallery Updates • By Mylene • Comments Off on [Gallery] Dove Cameron at the ‘Rise of the Isle of the Lost’ Book Launch. [Gallery] Dove Cameron at the Beautycon Festival NYC 2017. Dove Cameron, Events, Gallery Updates • By Mylene • Comments Off on [Gallery] Dove Cameron at the Beautycon Festival NYC 2017. [Video] Behind-the-Scenes with Dove Cameron & Modeliste Magazine. Dove Cameron, Videos • By Mylene • Comments Off on [Video] Behind-the-Scenes with Dove Cameron & Modeliste Magazine. [Video] Model Diaries Interview with Dove Cameron. Dove Cameron, Photoshoots, Videos • By Mylene • Comments Off on [Video] Model Diaries Interview with Dove Cameron. Dove Cameron for Modeliste Magazine. Articles, Dove Cameron, Photoshoots • By Mylene • Comments Off on Dove Cameron for Modeliste Magazine. Dove Cameron, is best known for playing a dual role as identical twin sisters in the Disney Channel teen sitcom Liv and Maddie and starring in Descendants with the highly anticipated sequel Descendants 2 coming out in July 2017. With a singing career on the rise, and vocals so compelling, transformative and thrilling, Dove has garnered a wave of recent attention and has been lavishly praised for not only her acting and singing careers but for being authentic, empowering, a role model for girls and unapologetically true to herself. She is 21 years old and about to embark upon perhaps the most exciting stretch of her career—- a document of self-discovery immersed in creativity, honesty and the pursuit of her dreams. Modeliste: Describe your favorite fan experience. Dove: Well, okay. I have a lot. I don’t know if I could ever choose one favorite fan experience, and that’s not just me saying that. I have a really cool kind of singular relationship with my fans because it took me forever to even acknowledge the fact that I had fans. That’s so confusing to me. As a human being, you see yourself through all of your stages. I remember what I looked like with braces. I remember who I was in my onsies when I was like four. To think of that human having people who see something different or aspire or whatever, relate to on a massive scale is just strange. It’s definitely not something that I think every human is born feeling. It’s not a natural thing that happens to everybody. It took me a really long time to sort of get my brain around that and then once I did, it was like I don’t want to have a separation between me and my fans. I want it to be like a friendship. If you see something in me that you relate to and connect with, I probably do too. If I were to get to know you, but there’s so many of you that I can’t really get to know every single one of you. I have this really friendly give and take with them and the other day I was in New York and I just hit up like four of them, randomly. I was like, “Hey. I know that you guys live in New York. What are you doing tomorrow?” They were like, “Oh, nothing.” We went and we got fries and then we got our nails done. It was just totally spur of the moment. We spent like the whole day together and they picked out my nail polish color. We ordered a lot of fries. It was amazing. Then later, one of those fans actually had me draw a heart and she got it tattooed on her wrist. I thought that that was kind of amazing. Not that I’m condoning that, but it was just so sweet. It was one of the most permanent things that I’ve ever seen and I love that. Modeliste: What has been your funniest or most memorable red carpet ever? Dove: See, I’m terrible at a red carpet. I just will never learn. I see all these photos of these girls in red carpets and like, okay I can do that. Then I get on there and I see myself in photo shoots and that person knows how to pose. On a red carpet, I do not know how to pose. I don’t know what happens to me, I think I just get anxious. There’s too much going on. I see the same faces and so sometimes I’ll have conversations with the paparazzi on the red carpet. You get a lot of me being real, like with spit coming out of my mouth, being like “hey!” I haven’t fallen yet. Now that I’ve said that I’m going to fall. Every one is memorable because I just lose my mind on red carpets. I have to embrace the fact that I’m a ridiculous human and they’re all memorable when you’re me. Modeliste: Who is someone you would love to costar with in the future? Dove: Wow. My two male actors that I’m obsessed with are Stanley Tucci and David Tennant. I love them so much. I feel like I know them. I’m like a fangirl. I’m obsessed with them. I also love Lee Pace. I fell in love with him during his Pushing Daisies days. That kind of comes fast. Then for women, I love Jessica Lang. Who else do I love? Obviously Meryl Streep. Kristin Chenoweth was my main hero that I really wanted to meet and spend time with. We’ve obviously built a really incredible working relationship. I want to work with her for the rest of my life. It’s a lot. [Video] Descendants Perfomance – Dancing with the Stars. Descendants 2, Dove Cameron, Television • By Mylene • Comments Off on [Video] Descendants Perfomance – Dancing with the Stars.